It is important to know the basic anatomy of a horse hoof. If you are going to ride horses, you'll eventually learn to clean their feet out and you may want to know the parts. 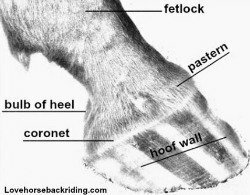 It is helpful to have a basic understanding where the different parts are on the hoof and information about the structures above the feet. If you pick up a horse's foot, this is what it will look like. The toe is the part closest to the front. This one is barefoot, meaning it doesn't have a horseshoe on it. Horseshoes protect the feet from excessive wear, such as extended training and when riding on rocky terrain. The sole is the natural protection for the bottom. It doesn't bear much weight as it should be slightly concave. The bulbs of the heel are at the rear. The frog is the v-shaped area. It adds cushioning to the structure to help protect it from concussion. That "v" shape is also where a lot of debris gets packed in that you will need to clean out to keep the foot healthy. Here you can see a side view of the outer anatomy of the horse hoof and a couple of the joints of the lower leg. Fetlock Joint is also called the ankle joint, and it produces the most movement in comparison with the pastern and coffin joints. The coronet is the top part of the hoof anatomy where growth of the wall starts. The hoof wall is the weight bearing structure of the foot. The wall grows about .25 inches (6mm) per month. This is the part of the anatomy that a horseshoe is attached to. It is keratinzed. That means that it contains keratin that makes the wall hard and strong. 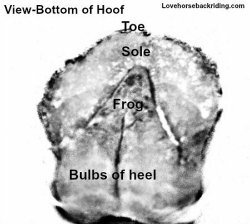 Leave anatomy of a horse hoof and go to the home page where you can learn all about drawing, riding, anatomy, and training.